Today I have an awesome post from Lindsey. Enjoy! 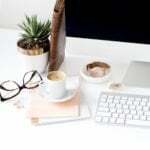 My name is Lindsey and I started my own personal finance blog a few months ago at http://centsandsensibility.ca. I have to say it's been a great adventure so far and I'm learning a lot as I go along my journey to become debt free! I like reading, writing, traveling and technology. I live in Alberta with my husband, teenaged daughter, and hate-filled wiener dog. Come over and visit my blog to find out more! About six months ago, my fabulous fiancée and I were married. We had been together for three years, shared our home and our lives – it was the next natural step and I was happy to do it. I didn’t think twice about buying a house together or merging our finances as happy couples do. Honestly, I still don’t think twice about it. However, as I’ve started my looking more closely at our finances and our ways of spending money and I wonder if we’re on the same page. We’ve had plenty of conversations about money, we pour over Quicken budgets and discuss who is going to pay for what, all the nuts and bolts. However, I’m not sure we know what we’re building together with our nuts and bolts. Outside of our decisions about who pays what, I’m not really clear on what my husband’s financial priorities are. Honestly, I’m not sure I’m completely clear what my own financial priorities are. I know I have a goal of being “debt-free” and of increasing my earning potential – but to what end? Where do I see us in a year? Five years? Ten years? Twenty? It’s going to be pretty hard to achieve our goals if we have no idea what “our goals” are. I know I’ve had some concerns about our financial situation and approached my husband with ideas to increase our cash flow or to cut down expenses so we could put more towards our debt but I’ve been met with some resistance for various reasons.I’ve grown frustrated with his responses but I’m not sure I’ve been very fair to him. Without a clear idea of what we want to accomplish together, he is only going to have his own ideas about what’s important to him. I know I have valid reason for suggesting ideas about increasing cash flow and cutting expenses and he has valid reasons for declining those same suggestions. We just don’t know each other’s reasons.So we need to sit down and have a conversation. But first, I need to sit down and work through what my perceptions and priorities are regarding money. I know I am bringing my own money ‘baggage’ into the relationship and I’m still developing my own “financial identity”. Have I talked about money with friends and family before? Why or why not? This is most definitely a yes! 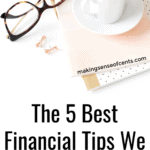 I have spoken at length with a few close friends and family about my money situation – I have been comfortable sharing my failures and successes; asking for advice when required; and just generally being able to go back and forth about money. I started talking money with my best friend quite early on, money and debt were a problem for me pretty early in life and I learned quickly that keeping it a secret made things worse. Talking through my debt issues with someone else just seemed to make it a little more manageable. I was also able to benefit from other people’s opinions and ideas, as well! What kind of money issues have you encountered in your past relationships? How did you address them? I was married once before and money was actually one of the key reasons why we didn’t make it. So honestly, I handled money issues badly in my past relationship. I was keenly aware that he made significantly more a year than I did and I really struggled with being able to speak up. I didn’t believe at the time I had a “right” to challenge his decisions about spending and saving. I started getting angry about his choices anyway – angry with him and angry with myself for not saying something. Before I knew it, I had lived through him getting laid off from one job; quitting another job without consulting me two days after we were married; following him across the country once for yet another job he ended up hating; and then following him across the country again for a job with the original company he was laid off from. By the time we got back to Ontario, I ended up having to exercise my “right” to speak by leaving him. Things were way too far gone for anything else to happen. Too bad I waited so long to say something honestly, eh? What do you think are your biggest strengths and weaknesses when it comes to managing your money? One of my strengths is that I’m an “ideas” person: If I need extra income or I need to cut costs somewhere, I’m resourceful enough to come up with a flexible and responsive strategy to address the shortfall and come out smelling like roses. Looking back, what would you have done differently with your money? One of the biggest changes I would make would be wait a little longer before going back to school. I didn’t have a clear idea what I wanted to do so I ended up starting two different programs before settling on Psychology. Honestly, I probably blew through twenty grand “finding myself” enough to know what I wanted to do. Also not cool. I also would have paid more attention to those first credit cards I got as a student. I had no concept of “credit” in my early twenties and it really showed in the way I treated the cards as free money – instead of the borrowed credit it actually was. What are some of the benefits you see of managing your finances as a couple? I believe this gives us a chance to build our future together. I didn’t have that chance in my first marriage and it’s really important to me to give us both an equal chance to work towards our goals. It’s important to discover what we want as individuals and honour those things by putting together a plan to make sure it happens. If we don’t see eye to eye on something, then let’s find a way to understand and compromise where and when we can. Managing our finances as a couple give us that chance that people in a relationship who manage their finances as individuals might not have. So I know a little bit more about why I want to do this even though it doesn’t make it any less intimidating. Taking a chance is my only option though. In my first marriage, I didn’t take the chance and it cost me much more than a few dollars. I’m a Female Breadwinner! I Earn Much More Than My Husband – So What? It is not uncommon to hear that the most common reason for divorce is money. Learning to talk about money and getting on the same page with your significant other is essential for a successful relationship. Working on finances with your significant other can certainly be rewarding, but it can be equally stressful. I think if you don't work together, though, there are going ot be at least some small issues later on. I think it's important for everyone to be in tune with what is going on with finances, because if only one person manages them they can easily have power over the other, whether it's simply psychological or not. Great guest post! Thanks for commenting! I agree that regular communication about finances is a must for couples. It is stressful to have those conversations – especially when you have different money values or different ways of dealing – but I think it would just be worse to wait. Taking about money stuff with husband also helps me feel a little bit more 'we're in this together' too. These are all great questions to get the financial conversation rolling. I am pretty lucky that my wife and I have very similar philosophies and goals about what we want to do with our money. That does not mean we don't have the occasional argument about it, but we tend to agree on most items. I agree with DC that both people need to be involved in managing the finances in order for it to work properly. I think the most surprising thing about starting this conversation is how big the topic actually is – it's not just about the nuts and bolts of who pays what: its about values, respect, trust, and compromise. It's such a big issue that touches on pretty much every aspect of your life. We're starting to have conversations about how we're managing debt – but we still need to talk about retirement planning; college fund for child; investments and other things that really matter. My money philosophy is slightly different from my hubs' philosophy. I'm much more strict with it while he doesn't mind letting the budget bend. It actually works out because I'm usually glad when I do take the time to do something special, and he's okay with admitting that some purchases aren't exactly necessary! Yes, I think there is definitely pros to having different philosophies about money. If you're able to work out a reasonable compromise that works for everyone, I think your strategy for dealing with money will probably be more well-rounded and thought out if you have to debate it through with husband first. I think it's dangerous to not discuss money with a spouse. You don't have to marry someone with the same financial philosophy, but it helps to be aware of each other's money tendencies so you know how to support one another. You're right, you don't have to marry your financial philosophy. However, being aware of what the other person works best with will definitely help you support each other. It's always interesting to me how different people do it though – some maintain separate bank accounts entirely; some put all resources in one joint account; some consult on absolutely every financial decision while others state that anything over $500 has to be cleared through the spouse permission system. It's fascinating to see how people make it work! Great article and thank you fro sharing. Lindsey and her husband are definitely on the right track and are very pragmatic. It's a must. 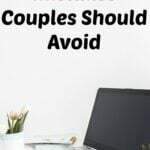 I know at least 2 couples that are not even remotely on the same page financially and it causes a lot of stress and unhappiness in those marriages! My recent post Is the envelope method a bad idea? I love how you talk about finding your own financial identity. You're absolutely right – it's hard to have a money conversation if you're not sure what you want or where you stand. My fiance and I are going through this right now and, honestly, it's taken us almost a year to get to a place where we both can come close to the same page. We're financial opposities and it took many more than one conversation to truly understand each others priorities and reach a good compromise. But getting started and sticking to it is what matters! Yes, finding my own financial identity didn't even occur to me until after starting the blog. It made me question what my values were around money; what I wanted to see for myself in the future; and how I wanted to share that with some one else. I have to say it's a bit of a relief to see that other couples might be going through a similar process and that it takes so. much. work. sometimes to meet in the middle. He wants to buy all house stuff new while I'm happy with Kijiji; I make fast decisions and act on them while he has to ponder for awhile; etc. We make it work, for sure, but there's definitely several chapters to the same conversation before we meet in the middle! Good for you and your fiance to start doing that before the wedding – that's such a great thing to get in the habit of doing from the get go. When it comes to money, both parties should be responsible. We should account each partner in every decision or financial plan in our life. It is important to be committed not only in terms of love but also in terms of finances, money and responsibility. I believe in building a life together means sharing in the important decisions in life. But sometimes the important things in life look different for people. What makes one person go nuts might have their partner say, "What's the big deal?" It's figuring out what you're about, being honest about that (warts and all) and then allowing your partner to do the same thing. I think it takes time, but it's important to have an open communication with your spouse. I think it's taken us almost two years to get on the same page. It's not easy at all! But if you both keep an open mind, communicate, and take note of the progress, you will come out ahead. My recent post How’s Your Health and Fitness Plan Progressing? Though we don't fight about money, my wife and I definitely discuss on a weekly/daily basis. We know what our long-term goals are, but discuss how to move toward those on a daily basis. 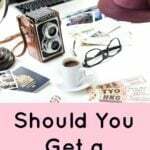 You laid out some great questions to ask, and I would suggest, anyone who is thinking of getting married should have "the talk" BEFORE tying the knot. We got on the same page about money about a month before marriage, and it's been WONDERFUL ever since. My recent post Budget Friday: Submission 9 – Final! I like the idea of setting some time aside each week to talk about money – it helps ensure that everything is going smoothly and things don't slip through the cracks or pile up. When you're in the day to day of life, I think it's easy to get distracted and fall off track without noticing – having that 'refresher' or 'catch-up' conversation would do wonders for that mindful approach that's so important with something like money. The only people I talk to about money are my parents and my boyfriend. Right now, my bf and I have an interesting money dynamic because I make a lot more money than he does, and it's caused some tough times between us before (he feels bad that I often end up paying for things). Money can certainly be a dicey thing to discuss, and in almost all of my past relationships, it's been uneven one way or another. I agree that money can be a dicey thing to talk about! It sounds like you guys are talking about it though, which can certainly help with moving things along – even if its tough! I have a similar experience with the money being quite uneven, one way or the other. I always felt really pressured if I've been at a money "disadvantage" in the past – but that had more to do with my own insecurities and less to do with the actual money. Respect and equality should be happening in the relationship, regardless of who makes what. Anyway, it sounds like you guys are working through it – so kudos to you! My recent post Talking about money: Beautiful Togetherness! This is definitely a tough subject, but if you are going to share a home and bank account, it's so important! It's definitely good to clear up WHAT you want to save for, what is a priority, etc. Working on finances as a couple is very different than if you're alone. You've got two minds, that can compete. Plus, compromise is just a nice way of saying someone is going to lose. Sitting down and writing out financial goals and then talking about them is key. This way you know exactly what the other person is thinking and you can figure out how to achieve goals to make you both happy. Best of luck with the blog and your future. My recent post Spring Weather is Here Update! My wife and I have recently really started talking a lot more about our finances every since we built a new house. I think just talking about things makes it that much easier to deal with your finances.